"I knew Sophie well enough to know that she'd never be seen again at Kartovice. But I was sure our paths would cross again one day." There's something particularly poignant about love during wartime. Under the stresses of warfare and the dehumanizing effect of the military, the combatants may find themselves unable to express feelings, while the desperation of the women left behind may reach the breaking point. 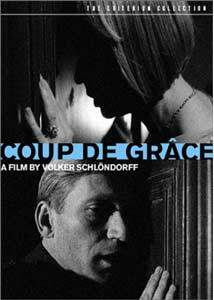 But the situation may be far more complex than this simple dichotomy, as demonstrated in Schl�ndorff's drama of the Russian civil war, based upon the 1939 novel Le Coup de Grace (the actual onscreen title of the film as well) by Marguerite Yourcenar. In 1919/1920, a German army unit fighting the Bolsheviks is stationed in Kartovice in the Baltic state of Latvia. The family of soldier Konrad von Reval (Rüdiger Kirschstein) has a chateau nearby, where his sister Sophie (Margarethe von Trotta) lives with their aged and senile Aunt Praskovia (Valeska Gert). Konrad comes home with his friend and fellow soldier Erich von Lhomond (Matthias Habich), and soon Sophie is madly in love with Erich. Although Erich has some momentary interest, he doesn't reciprocate the feeling. In reaction, Sophie descends into a self-destructive maëlstrom of promiscuity, espionage and revolutionary fervor with the local Bolsheviks. Shooting in black and white to give a period feel to the picture, Schlöndorff does a fine job of recreating the Red Scare atmosphere of the period, with Communists being brutally executed left and right. Not only is there a bounty on Reds, but the populace lives under the threat of execution if they fail to denounce the Bolshevists among them. Although there's plenty of material here for a fascinating movie, the story really focuses on the unrequited love affair of the principals (or triangle, if one includes Konrad and Erich's confused sexuality into the mix). Thus the political story really only becomes a backdrop and a way for Sophie to express her will. What exactly that will is remains somewhat ambiguous: does she just want to destroy herself? Or does she want to make Erich suffer in the process more than anything? Margarethe von Trotta (then the director's wife) really gives a fine performance as the obsessive Sophie, without descending into caricature similar to Fatal Attraction. Even though her motives may not always be entirely apparent, she breathes a fire and strength into the character that is quite fine. While Erich is seemingly meant to be a cold fish, Habich tends to overdo it a bit. One sequence where the pair are particularly good (featured on the keepcase cover) portrays them on opposite sides of a heavy wooden door, whispering their innermost feelings to each other. In this rare glimpse, while safely hidden away, the façade falls away from Erich and he almost seems to be human. Of course, with the hindsight of the filmmakers and the audience, we know that he will go on to become a Nazi, with everything that implies, which would not yet have been quite so evident to Yourcenar and her original readers. This additional bit of knowledge prevents one from getting too attached to Erich in any way, as opposed to the novel, where Erich is the first person narrator. In the supporting cast is Valeska Gert, who had a career in the 1920s in silent films. Here she is quite grotesque, a relic that has long outlived her time. Her symbolism of the decay of the old order is underlined by the comic song she sings; as it winds down, the score by Stanley Myers picks it up as a discordant waltz that degenerates into unintelligible fragments. She makes for a rather odd bit of comic relief, but she's not the only such instance. A slapstick hunting episode is undercranked and features a music hall score, for no apparent reason other than to present the soldiers experiencing a bit of joie de vivre. The principal fault here is the pacing. The tempo is very deliberate, often to the point of being tedious. For a film set during wartime, there's precious little combat, so war aficionados will not be too interested. Frankly, it took several attempts before I could make it through without falling asleep. For those who are patient and fully caffeinated, however, there are some good performances and a more complicated than usual look at male-female relations. Image Transfer Review: Criterion's anamorphic transfer (done by Sony) from the original negative suffers from many of the same issues as Columbia-Tristar discs mastered by Sony. There is frequent aliasing that I often found distracting, and prominent edge enhancement throughout causes rings to be visible around high contrast objects. However, the source print is very clean, with hardly any speckling visible, and textures are generally well-rendered. Black levels are good and a wide range of grey tones are on display. Audio Transfer Review: The 1.0 DD audio track sounds surprisingly good. The music is full and undistorted, and no significant hiss or noise was observed. The character of the family's out-of-tune piano comes across in a particularly vivid manner. Presence and depth are both effective, while the dialogue generally is quite clean. Quite satisfactory for a mono track. Extras Review: The principal extra is a documentary (43m:00s) featuring interviews with the director and Margarethe von Trotta, shot in 2001. The two were apparently filmed separately and the interviews edited together, but the segues are very natural and the whole flows extremely well. The documentary covers the origins of the film, casting, the use of black-and-white stock, as well as the creators' desire to make the horrors of war more concrete than in the novel. They're both quite chatty and engaging as they chatter on in French (subtitled in English). A brief essay from a book on Schl�ndorff's films is also included in the accompanying booklet. Chaptering on the feature is a bit thin, though the shorter documentary is very well chaptered. The layer change is quite seamless, occuring unnoticeably in the middle of a dialogue scene. Despite a clean source, there are some issues with the video transfer. An excellent interview helps make this intriguing drama worth checking out.